Father’s name and birthplace: Eli Moulton, Mass. 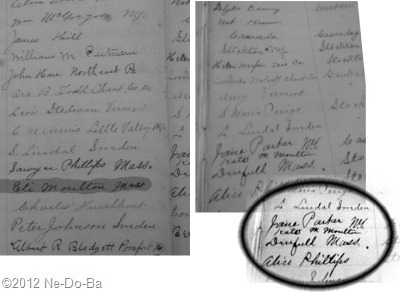 Mother’s name and birthplace: Kate M. Moulton, Drufuld Mass. Well, the first question that comes to mind is – who is Malvarn? Is this intended to be Marleah? Boy, did someone blow that. This is the date for the death of Carrie’s mother as recorded in her kids’ bible storybook and it is the date of death recorded in Laton’s journal (found online as a image). The entries in this register appear to be made in at least three different hands, so it makes it difficult to compare handwriting samples to get a better interpretation of what is written. There is a Malvina ten entries above, but it’s in a different hand. Still, I wonder if the person heard Malvina rather than Marleah, but didn’t know how to spell it. It’s a theory anyway. Trouble with that theory is she appears to have dropped the name Marleah in favor of Mary at least ten years earlier. I really expected to find the name Mary here. It is so simple and easy to write, but no, I end up with exactly the document I need to move back another generation in my research and it has this great big elephant sitting on it. I have no doubt this record is for the woman who was married to Laton Kanistanaux. However, at this time I have no proof this is Marleah because the given name in the official town record is not Mary or Marleah. Laton Kanistanaux is still alive, so he is the likely informant for this record. The 1875 NYS Census shows Laton and Eli Moulton living under the same roof, so Laton clearly knew Eli. A pair of cemetery lots were purchased by Laton Kanistanaux and Eli Moulton on the same day they buried Katie Moulton. It is clear Laton Kanistanaux knew these people personally and knew them to be the parents of Marleah. Henry, Carrie, and Nettie are all old enough to have known Eli & Katie well, so even if one of the kids gave this information, it is reasonable to believe they knew it to be true from their own personal knowledge of the relationship. So the most likely informants for this record are reliable. 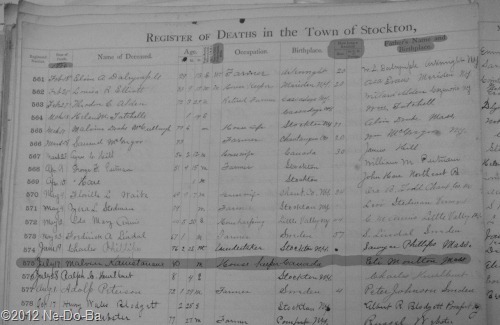 But what about the person who entered the information into the town’s ledger book? There are several different handwriting styles on this page which covers a period of only 6 months. It seems odd a small town would have several clerks working in the same office, but I suppose it is possible. Who else could be making these entries? Who else is involved in local deaths? Perhaps doctors or undertakers were allowed to make the entries themselves. If so, then this really is not the original record. It would be a long shot, but just maybe that doctor or undertaker kept their own records and just maybe those records still survive today. It certainly would be nice to have an original record using a known given name. Unfortunately, I do not have the time or money to chase after that long shot. Unfortunately, my friend Randy did not get a photo of the right hand page of this two page ledger. The town clerk sent a cell phone photo of the mother’s name as found on the right hand page. It is poor quality and very difficult to read the place of birth. Both Eli and Katie were from Massachusetts according to this record. Eli has no specific town listed but it appears Katie does. Too bad it’s not clear. Someone online has decided it says Deerfield. I am not so sure, but don’t know what else it could be. The word clearly begins with a “D”, has an “f” in the middle of it, and ends with “ld” or with “ll”. I checked with the Massachusetts state website. Deerfield is the only town in existence today that fits. Perhaps the name has been changed, so a check of my off line resources is in order. I have this wonderful series of booklets called “What was What, Where, and When” by Michel J. Denis. They list all the known local names found within towns, when towns changed counties, when they were incorporated, etc.. Looking in the Massachusetts booklet index under D, I see Dangerfield is the only other name with an “f” in the middle. Since my word has no sign of a “g” in it, I am grudgingly resigned to accept Deerfield as the intended word. I found it interesting to find Marleah not recorded as Indian at the time of her death. The family was known locally to be an Indian family and most members of the family are found in census records listed as Indian. Perhaps by this point in their lives, the family was thought of first as members of the local community without any racial label. Perhaps they have assimilated into the community to point their neighbors no longer see their color. Perhaps someone just forgot to fill in the column. Another item I found curious was the blanks for how long she has been a resident of Stockton and how long she has been living in the U.S.. Laton and the kids certainly would have known the answer to how long in Stockton because they all came together and the kids were old enough to remember when it was. I wonder if those questions were simply not asked?